While we still have more than a year to wait for Ender's Game to arrive in theaters, production on the film adaptation of Orson Scott Card's popular sci-fi novel appears to be wrapping up. Producer Roberto Orci dedicated the latest installment of the production blog for the film to discussing the work of Ben Procter and Sean Haworth, the Production Designer team for the movie. And he also shared two photos from the set of the film. Directed by Gavin Hood, Ender's Game is set in the future when mankind is preparing for a war against an alien race called Formics (also referred to as "buggers"). The story follows a child named Ender (Asa Butterfield), a kid who's recruited to attend battle school where children study and play games in preparation for the approaching war. Beyond the futuristic, space-set backdrop is a story about a kid who proves to be compassionate and sensitive in addition to something of a tactical genius. Harrison Ford is on board to play the role of Colonel Graff in feature adaptation, which arrives in theaters November 2013. Below are the photos Roberto Orci shared in the latest entry to the Ender's Game production blog. The first one shows us a warning that gravity ends beyond that line. 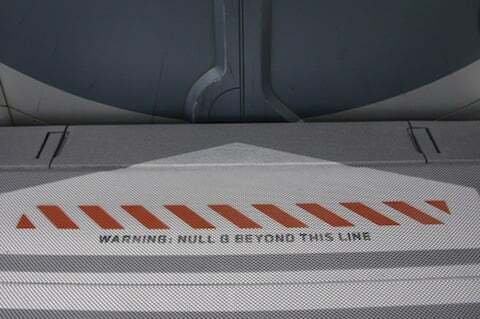 The entrance to the zero gravity battle room, perhaps? Remember, "The enemy's gate is down!" 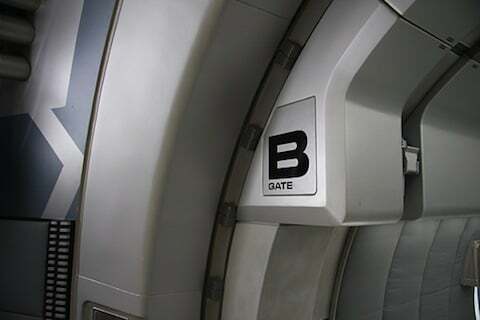 And speaking of gates, in this one, we have a look at the the side of an arching corridor and "B Gate." While both photos are presumably from the Battle School, Orci's entry addresses the Formic set when he discusses the work done by Ben Procter and Sean Haworth. Here's an excerpt from his post. As Ben described it, the most fun was creating the two contrasting cultures of Human and Formic technology and architecture. Ask them to describe the Formic world and you’ll get excited tales, imagining a Formic method of manufacture that was distinctly inhuman — a kind of biological 3D printer, with the drones building living spaces and spacecraft layer by layer. I like the mention of "two contrasting cultures." That, added to Ben's comments about creating something both exotic and beautiful for the Formics suggests something really different from the more practical looking set photos we've seen of the battle school. Orci goes on to discuss Sean and Ben's appreciation for the book, which is most definitely reassuring. As a fan of the novel, I like knowing that the people involved in bringing it to life for the movie are not only passionate about their work but also fans of the source material and will hopefully do their best to do the story justice in whatever way they can. In the case of Ben Procter and Sean Haworth, that's the challenging task of designing a look that will work for the movie and hopefully satisfy those of us who already have our own ideas about what these places look like based on Card's novel. …Oh, and filming on stages inside a rocket assembly facility — seeing real rocket parts that were destined for space flight — that certainly didn’t hurt ingenuity. Read the the full entry here. Update: According to a tweet Roberto Orci posted tonight, this is the last entry to the blog. That's disappointing, but it's been great following the updates on the production and getting some insight into the process of adapting the story for the big screen. Can't wait to see the finished product!